With the growth of citizen science comes the challenge of coordinating people, projects, and data. But these challenges also present a tremendous opportunity: with proper standardization, data can support multiple projects, allowing citizen science to address ever-grander issues and problems (Data and Metadata in Italy: Reporting from the Citizen Science Data). 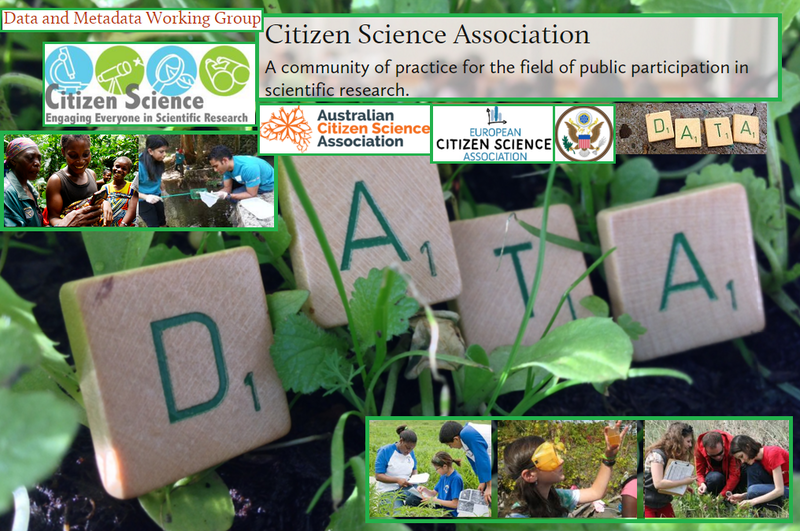 A Citizen Science Data and Metadata Working Group was established with the support of the Citizen Science Association (CSA) and the approval of the Board of Directors as formal affiliates of CSA, in 2015. To ensure that any standards developed under this initiative will be globally relevant, the Citizen Science Data and Metadata Working Group is also partnering with the European Citizen Science Association (ECSA), the Australian Citizen Science Association (ACSA), the US Federal Government, and other organizations. For example, the collaboration with the US Federal Government helps to ensure that metadata standards adopted for use in federal agencies (e.g. the recent White House memorandum Addressing Societal and Scientific Challenges through Citizen Science and Crowdsourcing) are compatible with the PPSR_CORE data model developed as part of Data Observation Network for Earth - DataONE. The Citizen Science Data and Metadata Working Group aims to support, advance, and facilitate data interoperability among and between citizen science projects, and other data repositories; and to promote collaboration in citizen science via the development and/or improvement of international standards for data and metadata. To support, advance, and facilitate interoperability and data sharing, the Citizen Science Data and Metadata Working Group is adopting oversight of the PPSR_CORE metadata standards for characterizing citizen science projects. To develop a common vocabulary and ontology for talking about citizen science, the working group has set itself the goal supporting the standardization of metadata describing different types of citizen science activities (project metadata) and metadata describing the data collected through citizen science (observational metadata), by mapping existing project metadata standards (including PPSR_Core) and the standards used to describe projects in different repositories. In particular, for observational metadata standardization, the Citizen Science Data and Metadata Working Group is going to: (1) propose a high level reference model for citizen science observational data, based on existing models from the spatial data infrastructure (SDI), biodiversity, and Big Data community, among others; (2) prepare a discussion on data lifecycle management for citizen science, including the possible projection of lifecycle models from other domains (e.g. Big Data and Spatial Data Infrastructures) onto observational data. For the project at large, the Citizen Science Data and Metadata Working Group is going to: (1) conduct a stakeholder analysis on citizen science data and metadata standards in order to investigate current requirements from both data providers, data users, and others; (2) investigate the legal, organizational, semantic, and technical aspects of interoperability, as well as interoperability related to political context; (3) develop a collaboration platform to coordinate activities, and publish and share resources. These and other issues and challenges regarding data and service infrastructures for citizen science were recently (January 26-27, 2016) discussed during a two-day workshop in ISPRA, Italy. The workshop was organized by the European Commission’s Joint Research Center that invited 20 international participants, including members of the three associations (CSA, ECSA, ACSA). The event showcased the highly collaborative nature of the global community of citizen science projects and portals, and represented the important and ongoing collaborative effort between the European, Australian, and American Citizen Science Associations towards citizen science data and metadata standardization. From a technical point of view, the Citizen Science Data and Metadata Working Group is going to: (1) support coordination between existing project repositories through specific Application Programming Interfaces (APIs), to share observational data across repositories, and to demonstrate proof-of-concept data sharing; (2) help coordinate a series of national repositories that are currently under development in Europe through mapping existing project metadata standards and using developed APIs. The Citizen Science Data and Metadata Working Group is continuing to recruit stakeholders to join this initiative (like, for example, by requesting a citizen science Domain Working Group (DWG) within the Open Geospatial Consortium (OGC)). Please contact Anne Bowser with any questions. April 16-May 21, 2016 - Citizen Science Day. May 19-21, 2016, Berlin, Germany - Citizen Science: Innovation in Open Science, Society, and Policy Conference.